Zsófia Miczek will be running 3 days of training on Ribble Valley Gundogs training ground. She is an expert of the Vizsla breeds, but any HPR breed is welcome. Open to: dogs over 8 months, with at least some retrieving skills.
) 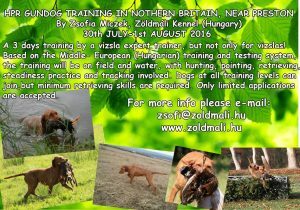 of the Zöldmáli Wirehaired Vizsla Kennel.